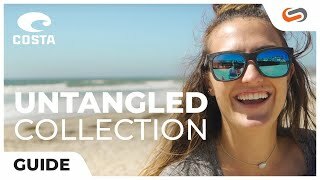 Part of the new Costa Untangled collection, the Pescador sunglasses were born for the water. The Pescador frame is constructed of 100% recycled fishing nets from the ocean. It features a classic square, wayfarer design for a larger fit. The Pescador has removable side shields to protect you from the sun and wind. To help keep the Pescador’s snug on your face Costa put Plusfoam on the nose bridge and at the end of the temples. Make sure to get your prescription Costa Pescador sunglasses today with the 580 technology!